There is a miniature horse farm about an hour away from us called “The Land of Little Horses“. This is someplace I’ve been several times before. The first time it was just my husband, Paul and I because he has first-hand knowledge of my love for horses and planned the day for me. The visits after that have been with at least one grandchild in tow. 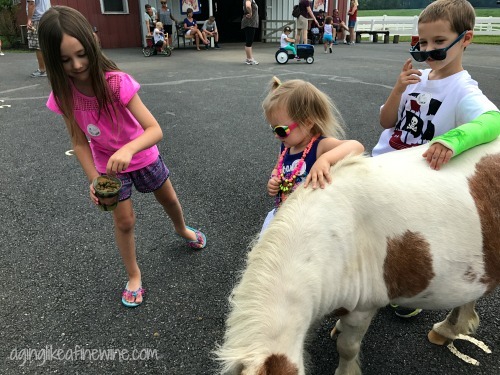 We planned a trip to take our 4 little grandchildren to the Land of Little Horses last Sunday. The day dawned warm and sunny; actually, a little too warm. We picked the kids up, exchanged vehicles and we were off (we always have to drive the parent’s vehicle when we take 3 or 4 because of all those car seats)! The first thing to do after paying admission is to buy some food to feed to the animals. And then we entered the Land of Little Horses, where we found lots of cute little miniature horses. Some are so tame they are allowed to mingle right in with the guests. They also have lots of other animals for the kids to see, including cows, pigs, rabbits, turkeys, goats, llamas, alpacas, turtles, pheasant and full-size horses, including one extra large Belgian. The day was made complete with a show they put on with dogs, a pig, goats and miniature horses. So this was the beginning of our talking about horses. When I planned to have the kids over for a day this week, I decided to stay with a horse theme, “H is for Horse” to be more specific. Thank you very much for pinning me! 1. 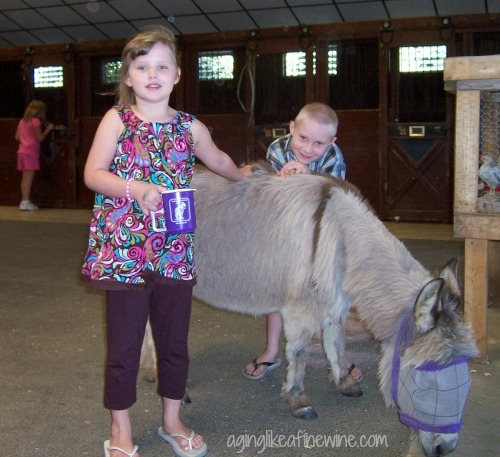 Our horse adventure started with the Land of Little Horses, which I know isn’t possible for most of you, but you might consider a local farm that allows field trips, a museum, zoo, library, pumpkin patch, fire department, etc. The library would be a great idea because each child could pick out a book related to the theme of the day. 2. I went online to education.com and printed some H worksheets, a maze and a connect the dot. Our day started with these. I had them ready to go at the kitchen table and the grandkids navigated right to them. 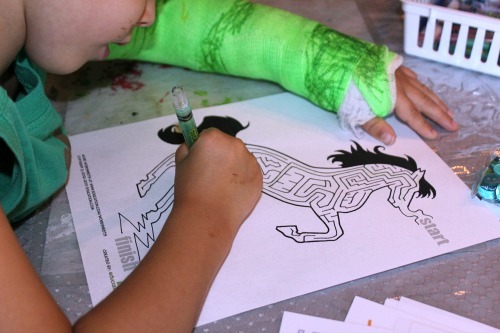 Jacob working on his horse maze. 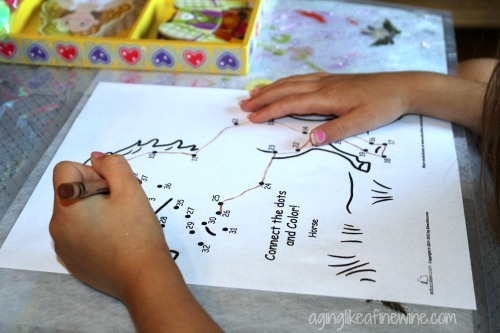 Maggie working on her dot-to-dot page. Finding and circling all of the H’s. 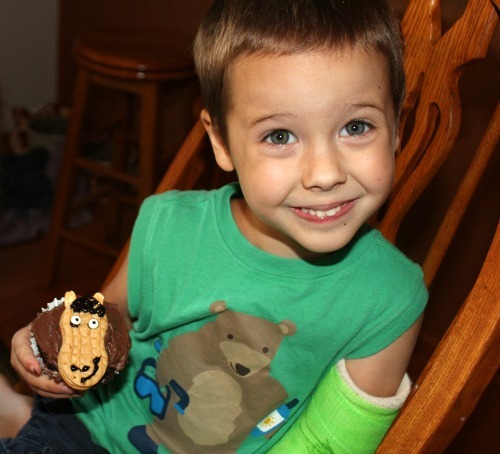 Little Gideon didn’t make a horse, actually, he decided to tear his & go play elsewhere. He’s certainly happy here! They are so simple to put together that you can just look at the picture and figure it out. Ours were made without perfection, but with lots of love! Jacob and his completed cupcake. 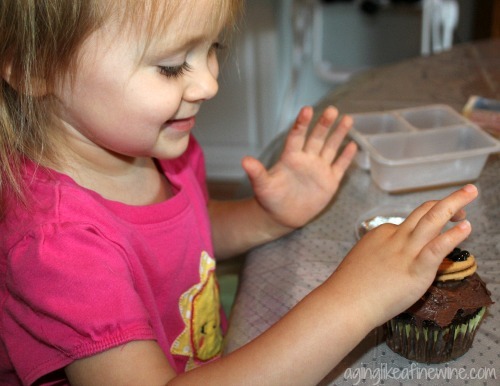 Zellene working on her cupcake. And Maggie enjoying the fruits of her labor and eating her cupcake! 5. While the cupcakes were in the oven we started a game. 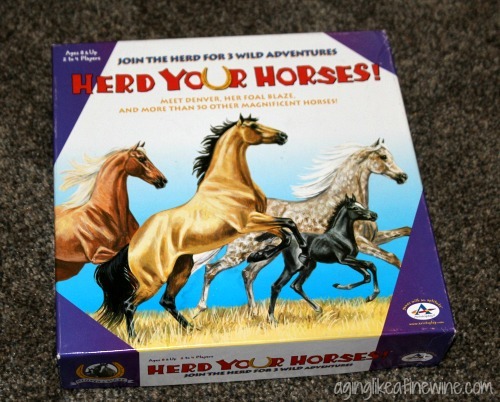 This game is called “Herd Your Horses” and we love it. The 3-year-old doesn’t have the staying power for this game. It doesn’t move along quick enough or have enough action to keep her attention. But the 5 and 7-year-old love it. 6. Cupcakes completed, game over and lunch time behind us, we moved on to rest time. I don’t know if rest time is more for them or for me! Today’s movie for rest time, Spirit! 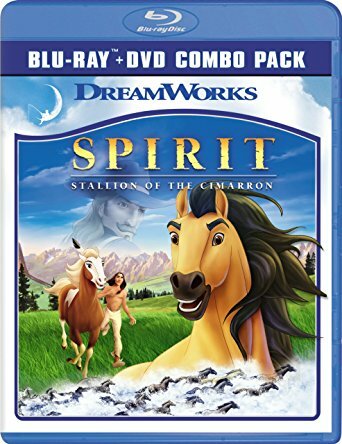 This movie is the story of a wild stallion named Spirit and the Native American that befriends him. print or draw a large upper and lower case letter and let your child decorate it however he/she chooses; crayons, markers, paint, feathers, tissue paper, sequins, etc. However, our horse activities were completed for the day so we moved outside for a little playtime. Followed by grandpa getting home, yeah! So Grandpa helped entertain while Grandma made dinner. The menu is always limited when the grandkids are here, let’s see pizza, pasta or chicken nuggets, what shall we make? Today it was spaghetti, complete with salad and toasted garlic bread. An old picture of my grandchildren that live in Calif. when we took them to the Land of Little Horses on one of their visits. They are now 12 and 14! After dinner, we were homeward bound with the grandkids because this grandma has to work tomorrow. We had quite the busy, action-packed day! Thank you so much for stopping by Aging Like a Fine Wine and reading about our learning letters adventure! You are wonderful! 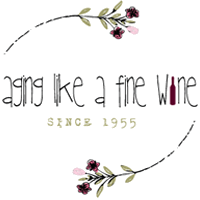 Read more about these types of adventures with our “B is for Birds” and “All About Flowers” days. This post will be shared on many of the link parties found on my “Where I Party” page. Thank you Chasta, it’s fun to come up with different ideas based on a letter of the alphabet. Thank you for stopping by! We have lots of fun playing it! Thanks for stopping by Crystal! It’s one of my favorite games to play with my grandchildren. 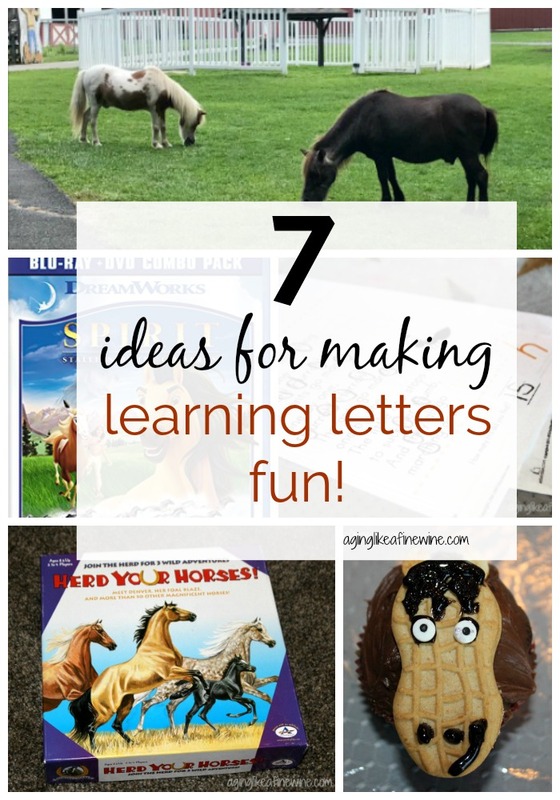 I love all the different ideas for learning letters. All the activities throughout the day definitely kept them interested and entertained!! Definitely a win, win situation!! That horse farm sounds amazing!! My kids love animals. I think we might be do for a local trip to the farm to see animals! Thanks for the ideas!! What a fun and memorable day. 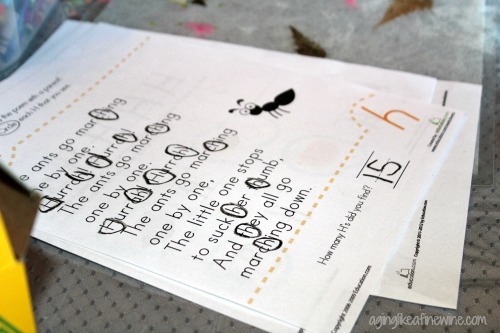 I just started homeschool for my 5 year old twins. I think they would love herding horses game. I will keep your ideas in mind for letter recognition. Thanks for sharing. This looks like so much fun! My kids would love the movie! Thank you for the fun ideas! All great ideas. 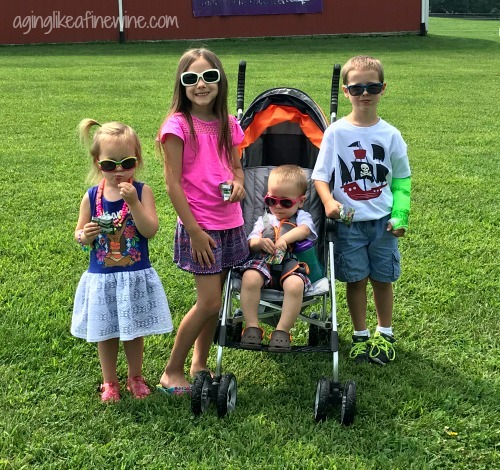 You have precious grandbabies 🙂 Thank you Teresa for linking up and co-hosting at the #BloggingGrandmothersLinkParty. I shared your post on Facebook, Pinterest, and Twitter. Thank you Dee. They are precious and so much fun! Thank you for sharing! 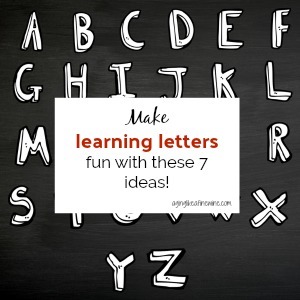 Hi Teresa thanks for some great ideas on learning letters. My grandson just loves the movie about Spirit the Stallion. 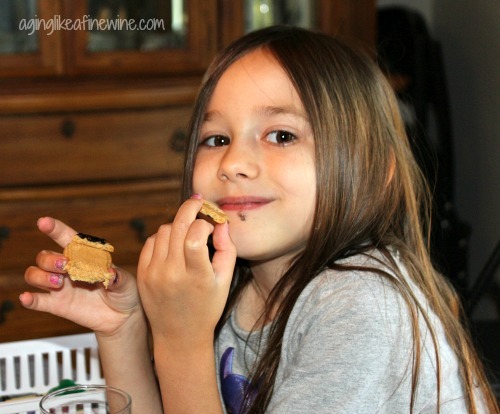 Thanks for linking up and sharing with us at #BloggingGrandmothersLinkParty. Your grandchildren are very lucky to have you in their lives. It is a very cute movie. My grandchildren enjoy it too! What fun ideas! It looks like all the kids had a great time too! They’ll treasure the memories forever!! Thank you for sharing at #BloggingGrandmothersLinkParty. We did have fun. 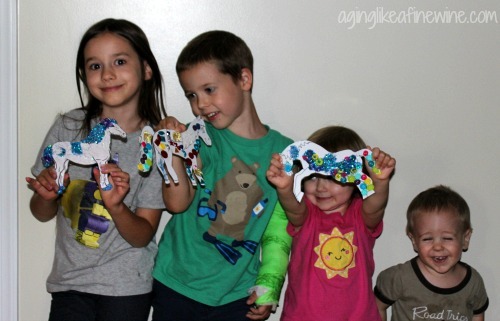 The girls love the arts and crafts and the boys love the games!